If you purchased a motorcycle recently, congratulations! 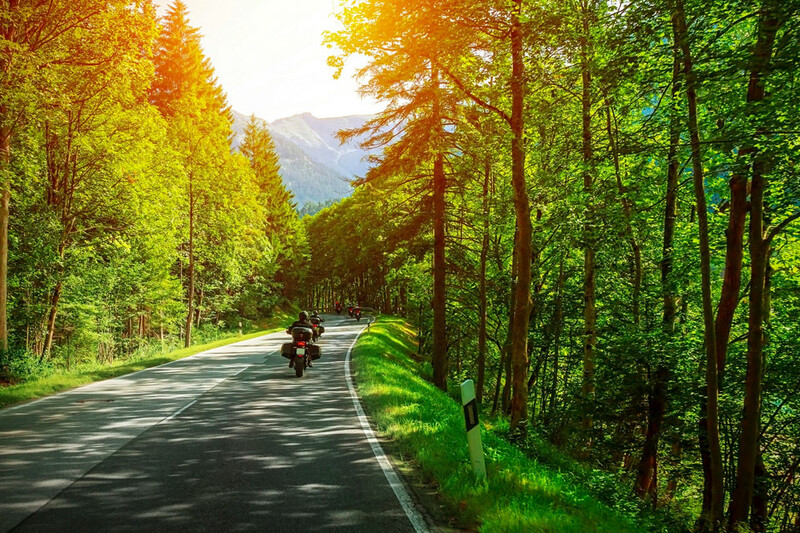 Maryland and the surrounding areas have some of the most beautiful motorcycle routes on the east coast. In addition, with the traffic in Maryland, D.C., and Virginia, riding a motorcycle can be an economical, convenient form of transportation. For readers who are seasoned motorcyclists, the information we cover in this chapter may be old news to you. However, it is always wise to review basic motorcycle information periodically so that you do not become complacent and forget the basic motorcycle rules that can help keep us safe as we enjoy motorcycling in Maryland. In Chapter One, we review some of the basics of motorcycling, including purchasing motorcycle insurance, riding gear, and motorcycle licensing in Maryland. Before you take your first ride, you must purchase basic liability insurance for your motorcycle. Maryland requires riders to carry minimum liability insurance in the amount of $30,000 for bodily injury ($60,000 per incident for two or more victims) and $15,000 for property damage. You may purchase insurance in higher amounts, which is usually recommended if you have personal assets that you want to protect in the event of a lawsuit filed by an accident victim. For severe injuries, $30,000 does not cover medical costs, much less other damages such as lost wages, physical pain, and permanent impairment. Because a motorcyclist is at risk for traumatic injuries during a motorcycle crash, you may also want to consider purchasing insurance that protects you in an accident. Even if you sue another driver who caused a crash, that driver may only have minimum liability insurance. Therefore, you could be responsible for thousands of dollars in losses if your damages exceed the minimum insurance limits. Liability insurance only protects the people injured in an accident that you cause. You must purchase additional insurance that covers your injuries. Underinsured/Uninsured Coverage — Underinsured and uninsured coverage protects you if the driver who caused the crash does not have sufficient insurance or no insurance to pay your accident claim. Personal Injury Protection (PIP) — PIP is a no-fault insurance policy that pays your medical bills and some lost wages regardless of who causes the accident. Collision Insurance — Your lender will require collision insurance to pay for damages if your motorcycle is damaged in an accident that is your fault. Comprehensive Insurance — Covers losses from fire, theft, wind, water, and vandalism. Medical Payment Insurance — Med Pay can also be very helpful in paying medical bills after an accident regardless of who is at fault. In most cases, it is wise to purchase the highest limits of all insurance types that you can afford. While you hope that you never need the insurance, a day may come when you are thankful that you have insurance coverage to help pay for your damages and losses after a motorcycle crash in Maryland. It is estimated that motorcycle helmets saved the lives of 1,859 people in 2016. Another 802 lives could have been saved had everyone been wearing a motorcycle helmet. Studies have shown that helmets reduce the risk of death by 37 percent and reduce the risk of head injury by 69 percent. Maryland is one of several states that have mandatory motorcycle helmet laws for all riders. Maryland requires all motorcyclists and riders to wear a motorcycle helmet when riding a motorcycle. Failing to wear a helmet may result in a traffic ticket and substantial fines. In addition to wearing a motorcycle helmet, the law requires motorcyclists and riders to wear eye protection (i.e. goggles, face shields, or spectacles) unless the motorcycle is equipped with a windscreen. Because of the high risk of injury in a motorcycle crash, some riders are utilizing the latest technology in motorcycle safety gear, including motorcycle jackets that are equipped with airbags or special padding to reduce the impact of a collision. If you are a serious motorcyclist, you should also be serious about protecting yourself from potential injury. While you may be a cautious, attentive rider, you cannot control the actions of other drivers, weather conditions, or road conditions. It is better to take extra steps to protect yourself and your passenger than to suffer a traumatic injury that might have been less severe with the proper safety equipment. As you probably have determined by reading through the above information, Maryland is serious about protecting motorcyclists. In another effort to help keep you safe while riding a motorcycle, Maryland has specific requirements for motorcycle licenses. The requirements depend on several factors, including your age and your current driving status. If you have a current Maryland driver’s license, you can apply for a Class M (motorcycle endorsement) once you complete a Motorcycle Safety Program course. If you do not complete the course, you must obtain a motorcycle learner’s permit, pass a knowledge test, and pass a skills test before receiving a motorcycle license or endorsement. A Motorcycle Safety Program can be very helpful, even for riders who have some experience riding a bike. Safety courses cover basic traffic rules, safety tips, and special maneuvers that may help you avoid a motorcycle accident. It is worth the time and cost to increase your knowledge and decrease your risk of being injured in a motorcycle crash. The Pinder Plotkin Legal Team assists motorcyclists and their passengers file injury claims and accident claims. Call 410-661-9440 to schedule a free consultation with a Maryland motorcycle accident attorney with Pinder Plotkin LLC.